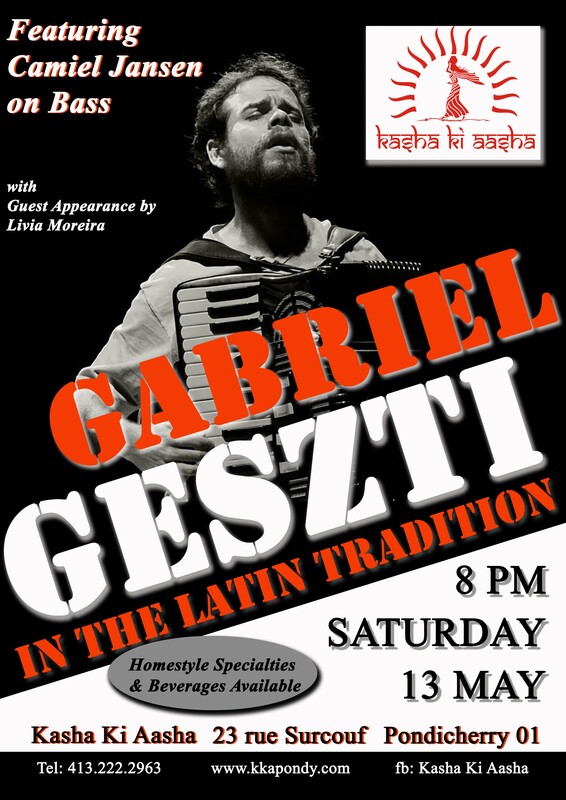 Kasha Ki Aasha welcomes Gabriel Geszti to our terrace this Saturday evening. Gabriel will be playing the best of Latin traditional music backed by Bass player, Camiel Jansen with a special guest appearance by Livia Moreira. Come join us at 8 pm at the best place to while away a sultry Saturday evening with great music, great food and great people. Starting at an early age of 9, Gabriel began his studies in classical piano and by age 17 he was working as a professional pianist in popular music & jazz. Gabriel is a versatile pianist, composer and a dedicated piano technique teacher. Born in Rio de Janeiro, he completed a degree in Teaching from theFederal University of Rio de Janeiro. He trained under Aida Gnattali, Estela Caldi and Rafael Vernet over the course of his career. His talent and skill on the piano has taken him across the world and he has toured with Gabriel Grossi, Brazilian Singer -Wanda Sa, Brazilian percussionist -Nana Vasconcelos, Mauro Senise, Rodrigo Maranhao. He has also toured with popular Italian singer Cristina Renzetti and guitarist Giancarlo Bianchetti. His work has also taken to perform on a project titled ‘Brazil in China’ with Lui Coimbra, which led him to perform in Shanghai and Beijing. Gabriel is also very active in Brazilian popular music and he toured with the famous samba composer and guitarist Paulinho da Viola in 2011. His classical training led him to perform with pianist Estela Caldi and conductor Homero Malhaes. Camiel is an exceptionally talented and emerging musician from the Netherlands, who specializes on the upright bass. Versatile and familiar with jazz, classical and pop music, Camiel also composes and arranges for horns, strings and big band. Currently, he is a leader of ‘Ikarai’ a modern classical group that integrates classical music with improvisation techniques. The group released an album titled ‘Fly’ to wide acclaim in fall 2016. Camiel won the ‘De Grote Prijs van Nederland’ (Grand prize of the Netherlands), which is a series of music awards that recognizes new and talented Dutch musicians. He has arranged horns and cello for the EP ‘DeBekentenis’ by Charl Delemarre. He has also toured with the contemporary jazz group Sindri Mar Eydal Fridriksson Group in Norway. Find us at 23 rue Surcouf, Pondicherry 01!! !